Tibet is a beautiful country tucked away in the Himalayan mountains. 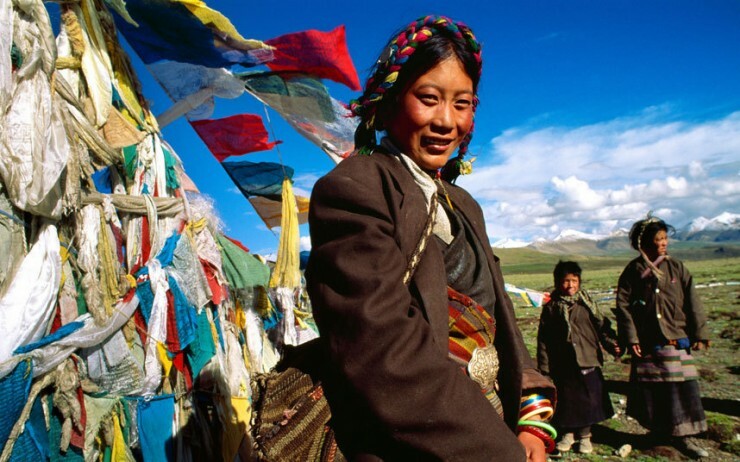 Until the 1950’s, Tibet was an soverign state with the gentle, compassionate, and non-violent beliefs of Buddhism permeating every corner of normal Tibetan life. In the 1950’s, the Chinese government invaded Tibet and caused serious (ongoing) damage to this small nation. His Holiness the Dalai Lama [sometimes referred to by the initials HHDL] was forced to flee Tibet. The HHDL as the spiritual and temporal leader of the Tibetan people is known throughout the world for his spirit of non-violence and compassion. In 1987, he was awarded the Nobel Prize for Peace. The HHDL continues to travel around the world, sharing spiritual teachings that speak to not only the Tibetan crisis but global concerns for peace and the environment. The Chinese government has banned pictures of the HHDL in many places in Tibet, including monasteries. In October 1995, five Tibetans living in the U.S. staged a hunger strike for thirteen days in front of the U.N. Though the hunger strike was stopped before anyone died — at the personal request of the Dalai Lama — these valiant Tibetans brought international political and media attention once again to the plight of their country. There is little I ask of you, the reader, except to become more informed about the “Tibetan” problem, even just taking a *few minutes* of your time to do this now. If you are unaware of the political upheaval and suffering currently being experienced by the Tibetan people at the hands of the Chinese government, please read those sites notated with an asterisk (*) And afterwards, share what you have learned with even a single person who was not aware of this issue. In this way, you can take part in the growing international movement to assist the Tibetans and stop their culture from being destroyed. If you wish to become even more involved, the Internet has many resources to offer on the subject.